Kunu is a non alcoholic beverage and the origin of the drink can be traced to northern Nigeria. It can be described as some sort of milk shake but surprisingly, it is not gotten any where near cows! It is a non-alcoholic drink primarily made from grains. Kunu is made from grains such as corn, sorghum, millet, corn, rice or sorghum.. It is also known as Kununzaki, kunnu or kunu zaki. The ingredients used in preparing Kunu are millet (or rice, sorghum or maize), water, sugar, date fruits, cloves, ginger- to give it a tingling sensation and sweet potato, which is an optional ingredient. You have to slightly ferment the millet or any grain of choice by soaking in cool water overnight. Then the next day, you mix the chopped ginger, cloves, sweet potato with the previously soaked millets and blend all the ingredients together. After blending all the ingredients, divide the mixture into two parts. Add boiling water to one of the separated parts, stir well, add the other parts, some water, keep mixing until you get the consistency you want. Some people add tiger nuts to their Kunu drink. Tiger nut is not only rich in protein but also puported to be a good libido boost. Hey, don’t go drinking 10 bottles. We won’t be responsible for what happens down there. 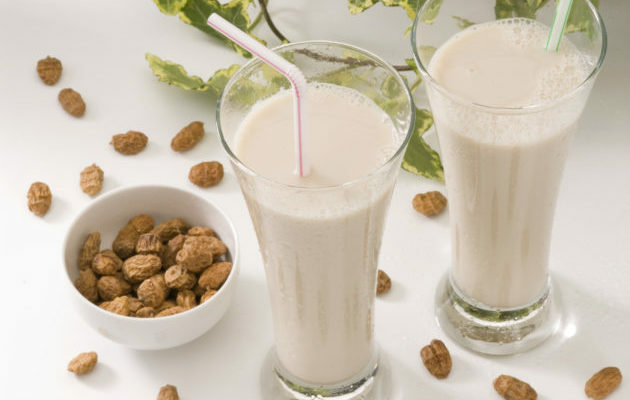 Taking Kunu drink helps relaxes the muscles and is good for women at the stage of menopause. In which case, it reduces the discomfort that sometimes comes with menopause. It helps in the prevention of rheumatoid athritis, soothes cold, coughs which is facilitated by one of its constituent ingredients, cloves; cloves help in loosening mucus in the oesophagus passage. Potassium and magnesium are very strong minerals in reducing blood pressure and they are found in the Kunu drink in addition to Vitamin B3. Hence, it makes for a healthy drink that prevents cancer, and eye disease. If you are using sweet potato as part of your ingredients, you would have a richer drink with plenty Vitamin C antioxidants. Research has shown that Vitamin C has a very high potential of increasing sperm count and alsoneutralizing sperm busting free radicals. It is good for lactating mothers and helps increase the flow of milk in lactating mothers. One of the questions that I hear people often ask is if Kunu drink can prevent weight loss or increase in weight. Well, weight loss doesn’t so much have to do with what you eat but how you eat them. If you use minimal sugar in the prepaaration of the drink, you end up with less calories. On the flip side, Kunu can massively help with weight loss as well. Everybody needs a daily recommended alllowance for protein, mineral, vitamins and other things but then if you get your recommended protein from meat, you can imagine how much weight you would add because of the calorie content. However, Kunu has all the recommended daily allowance of protein that you need so you can lose weight and still drink guilty free. You can enjoy a cup of Kunu alone or with a meal. Previous Ikokore- The Wonders of a Western Nigerian Food!